Our bespoke workshops offer a wide range of circus skills which can be tailored to your requirements. 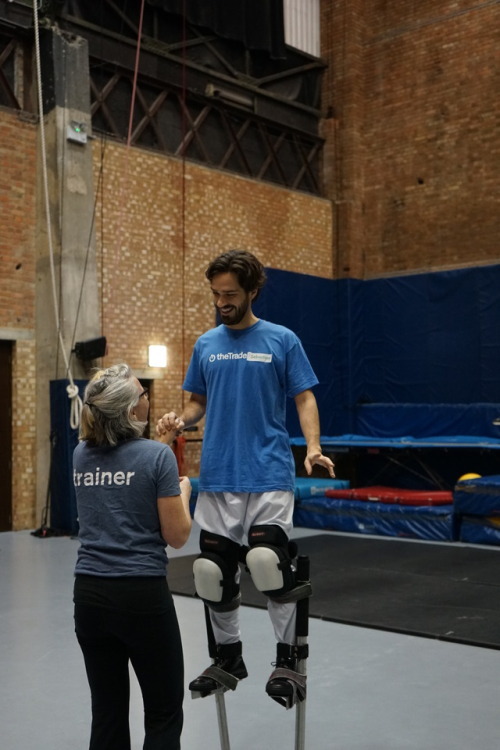 Bespoke workshops can take place in our professional circus training spaces in Hoxton on Wednesdays and Thursdays. We can sometimes offer other days and longer workshops, please get in touch to check availability. We are also able to offer workshops at a venue of your choosing (please note that circus skill availability may be more limited at other venues). See what your day will look like. A full range of circus activities are available in our bespoke workshops. Here at the National Centre for Circus Arts we can offer aerial skills, like flying or static trapeze, as well as acrobatics, tightwire walking, juggling and much more. 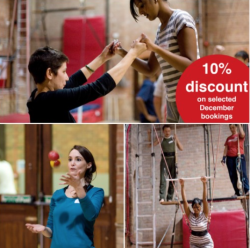 Find out about the full range of available circus skills. Prices for our bespoke workshops start from £1,000 +VAT for a team of up to 11 participants. Some additional costs may apply to workshops at other venues. To discuss your team's requirements or book a workshop get in touch at workshops@nationalcircus.org.uk or on 020 7613 8258.